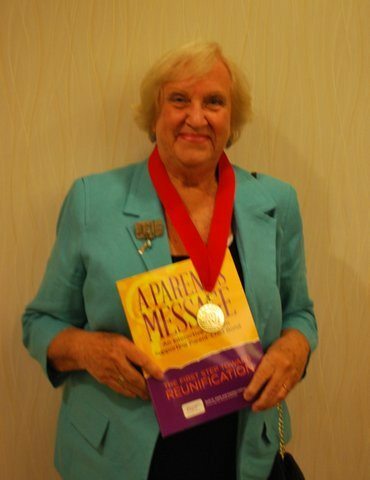 Carolyn LeCroy’s award-winning book, A Parent’s Message: An Interactive Program Supporting Parent-Child Bond, has been recognized yet again as the top of its class. The book has been given a gold medal in the 2014 Florida Authors & Publishers Association (FAPA) Annual President’s Book Awards. Our workbook, which is designed to assist children of incarcerated parents in maintaining family bonds, was nominated in the Education Division. For a complete list of Winners, click here. To order a copy of the book, click here. Congratulations to Carolyn and her entire publishing team! 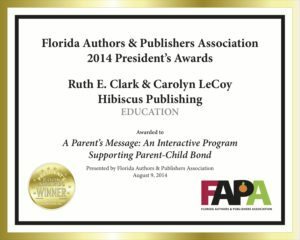 Florida Authors & Publishers Association, Inc. (FAPA) is dedicated to providing the highest quality of information, resources, and professional development to members and others interested in the writing and publishing profession in the state of Florida. FAPA is a non-profit 501(c)(3) organization and is affiliated with the following national publishing organizations: IBPA (Independent Book Publishers Association), AAP (Association of American Publishers), and APSS (Association of Publishers for Small Sales).